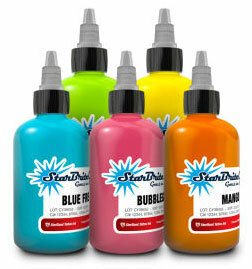 We are proud to offer Starbrite™ Pure Uncut Pigment Dispersions. These inks have become very popular due to their vibrant look years after the tattoo has been healed. We've added 30 new colors, so we now offer 71 different colors in either 1/2 ounce or 2 ounce bottles. All StarBrite™ inks are pre-sterilized for safety and convenience. Store in a cool, dry location. Choose either 1/2 ounce or 2 ounce bottles below.